Leptogium digitatum (A. Massal.) Zahlbr. Thallus: foliose, 2-5 cm in diam., loosely adnate, irregularly lobate lobes: very irregular, short, +plane, separate, 0.5-3 mm wide, 170- 400 µm thick, strongly swelling when wet; apices: rotund, entire to lobulate, often undulate, usually somewhat erect upper surface: brown to medium gray, usually dull, initially smooth to roughened, lacking isidia internal anatomy: with upper and lower cortices consisting of a single layer of irregularly isodiametrical cells 5-12 µm in diam., internally with loosely interwoven chains of Nostoc and hyphae lower surface: light gray or brown, smooth, with thin (c. 25 µm thick) white tomentum composed of spherical cells Apothecia: common, laminal, sessile, 1-3 mm wide disc: orange brown to red-brown, concave margin: thalline, concolorous with the thallus, often with microphylline appendages exciple: euparaplectenchymatous, 45-70 µm thick centrally hymenium: hyaline below and thinly yellow to brown above, 150-190 µm tall; paraphyses: unbranched, c. 1.5 µm wide, slightly inflated apically; subhymenium: pale yellow, 20-45 µm thick, with a distinctive euparaplectenchymatous supporting tissue under the hymenial layers, 130-140 µm wide asci: cylindrico-clavate, 8-spored ascospores: hyaline, muriform, 5-7-septate transversely, 1-3-septate longitudinally, ovoid to ellipsoid, 25-40 x 14-21 µm Pycnidia: not observed Spot tests: all negative Secondary metabolites: none detected. Substrate and ecology: usually on acidic rocks, often among mosses over rocks, rarely on trees World distribution: North and South America, eastern and southern Africa Sonoran distribution: Arizona, Chihuahua and Sinaloa. Notes: Sierk (1964) clearly recognized this species as L. inflexum Nyl., a species treated by Jørgensen (1973) as a variety of L. burgessii. 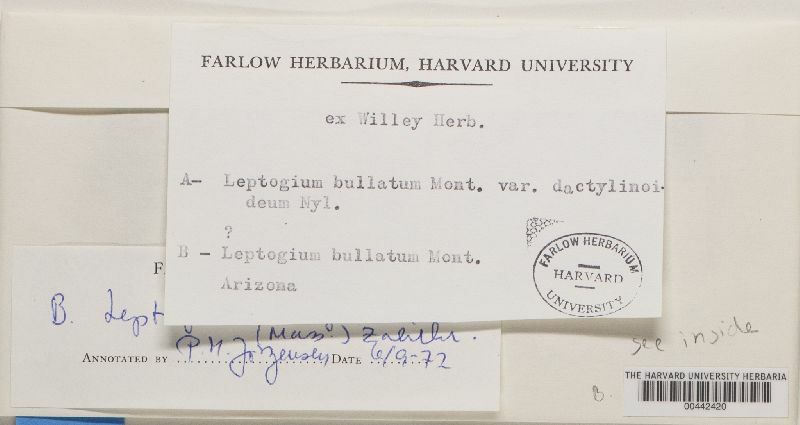 However, Jørgensen has determined that the southern Arizonan species better fits L. digitatum, a South American species that apparently reaches its northern limit in Arizona. The apothecia of L. digitatum have a euparaplectenchymatous layer above the cyanobiont layer. Leptogium digitatum was also confused with the rather similar L. burgessii, which has a thinner, non-wrinkled thallus and a different anatomy of the apothecia. When dry, L. burgessii typically has a thinner, smoother thallus than L. digitatum. Furthermore, L. digitatum, in contrast to L. burgessii, typically swells markedly when wet and has an unusual support layer under the hymenium. Although L. digitatum belongs to the sect. Mallotium, the white tomentum on the lower surface is extremely short and may be readily overlooked.